When you become a master franchisee, you become a franchisor in an area and are authorized to offer subfranchises through your master franchise license. As with any franchisor, your master franchisor will prepare and provide to prospective franchisees its own FDD and agreements that will contain information about you and your services. In most master franchise relationships, the first thing you will likely be required to do is open and operate a few locations of your own. Once that has been accomplished, you will then be allowed to offer franchise rights to other franchisees (called subfranchises) to open and operate franchises in your market. The subfranchisee may execute a franchise agreement directly with the franchisor or with the master franchisee. The franchisor may or may not have the right to approve the new subfranchisee. The subfranchisee may receive training and continuing support from the franchisor, the master franchisee, or both. The subfranchisee may pay fees directly to the master franchisee, to the franchisor, or a combination of both. 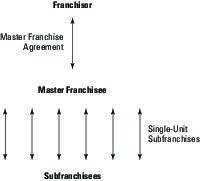 Of all the types of franchising relationships, the master franchise or subfranchise relationship is the most complex. This image shows the master franchise relationship. The master franchisee family tree. With the exception of foreign franchisors entering into the United States, don’t expect a lot of U.S.-based franchisors to offer a master franchise relationship today. Although it is still used to some extent by U.S. franchisors internationally — and the trend is shifting away from master franchising to multi-unit development relationships, as technology and other advancements have made it possible to better directly support franchisees internationally — its popularity is waning. If you are a franchisor looking at developing internationally, and that includes foreign franchisors entering the United States, you should first consider going direct and offering a multi-unit development agreement and not use a master franchise relationship. By franchising directly to multi-unit franchisees, you avoid the need to share the fees and other revenue in a market and retain most of the benefits of master franchising. Technology has reduced the need for master franchising to a very great extent, and with a well-structured multi-unit development growth strategy, much of the expected benefits of master franchising are no longer as significant. There are occasions where master franchising still makes sense, but rarely today is it the first choice. Explore other approaches first.